Fractures of the bones are classified in a number of ways. A simple fracture involves a single fracture line through a bone. 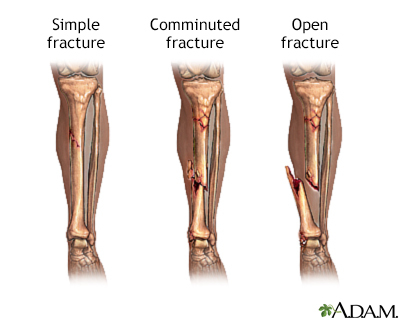 A comminuted fracture is one in which the bone has been fractured into two or more fragments. 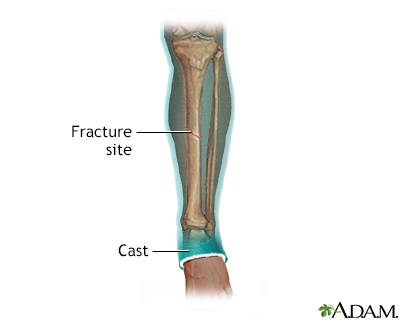 An open fracture is one in which the fractured bone penetrates the skin. Open reduction, and internal fixation- this involves a surgery to repair the fracture-frequently, metal rods, screws or plates are used to repair the bone, and remain in place, under the skin, after the surgery. This procedure is recommended for complicated fractures not able to be realigned (reduced) by casting, or in cases in which the long-term use of a cast is undesirable. 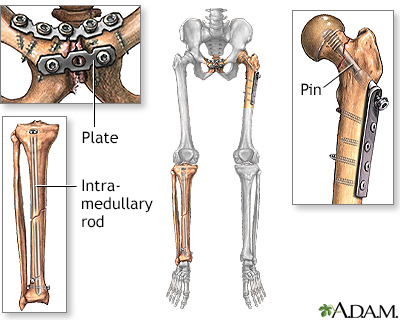 Open reduction, and external fixation- this involves a surgery to repair the fracture, and placement of a external fixation device on the limb with the fracture. This device is an external frame which supports the bone and hold it in the correct position while it is healing. This technique is generally applied to complex fractures that cannot be repaired using open reduction, and internal fixation. While the patient is pain-free (general or local anesthesia), an incision is made over the fractured bone. The bone is placed in proper position and screws, pins, or plates are attached to or in the bone temporarily or permanently. Any disrupted blood vessels are tied off or burned (cauterized). If examination of the fracture shows that a quantity of bone has been lost as a result of the fracture, especially if there is a gap between the broken bone ends, the surgeon may decide that a bone graft is essential to avoid delayed healing. a) one or more screws inserted across the break to hold it. b) a steel plate held by screws drilled into the bone. c) a long fluted metal pin with holes in it, is driven down the shaft of the bone from one end, with screws then passed through the bone and through a hole in the pin. In some cases, after this stabilization, the microsurgical repair of blood vessels and nerves is necessary. The skin incision is then closed in the usual fashion. 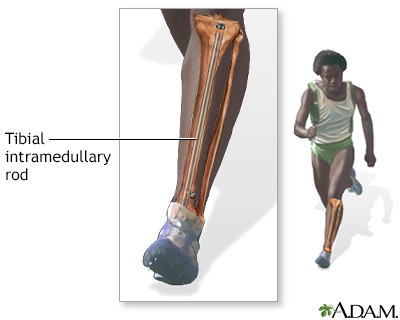 The advantage of internal fixation is that it often allows early mobility and faster healing. Unless the internal fixation causes problems, it is not necessary or desirable to remove it. The long-term prognosis is excellent. The length of the hospital stay depends on factors such as the condition of the bone, the presence of infection, the state of the blood and nerve supply, and presence of other injuries. Children's bones heal rapidly, usually in 6 weeks time.